The neat time-loop story-telling is a lot of fun, but the repetitive combat and limited gameplay doesn’t quite keep up. In the 2014 sci-fi action film Edge of Tomorrow, Tom Cruise gains a power that lets him restart a day after his death. Each “run” he learns something new about the war against the aliens. 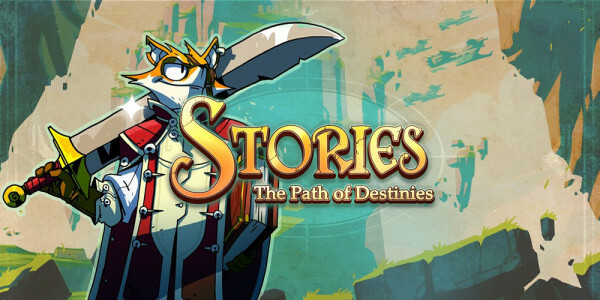 Stories: The Path of Destinies features this same neat idea. The intersecting story works well, but repetitive levels and limited content prevent Stories from becoming truly memorable. The world of Stories: The Path of Destinies takes place in a fantasy land of flying air ships and talking animals. You play as Reynardo, a charismatic swash-buckling fox. The mad emperor’s armies are bearing down on the rebel base. It’s up to Reynardo to make the right decisions to save everyone. The story is told through a magic book you find during the prologue. After each of the relatively quick levels you’re given an important decision to make. Save a friend or find a weapon? Sacrifice the general’s daughter or appeal to your past relationship? It’s the video game equivalent of a Choose Your Own Adventure novel. Good observation. The story does have an Edge of Tomorrow vibe to it.